Why not let your students experience the full depth and creativity of Computer Science? Through hands-on sessions including LEGO™ Robotics, Java and more, we aim to share the passion we have for the field with your students. Contact us for more information. 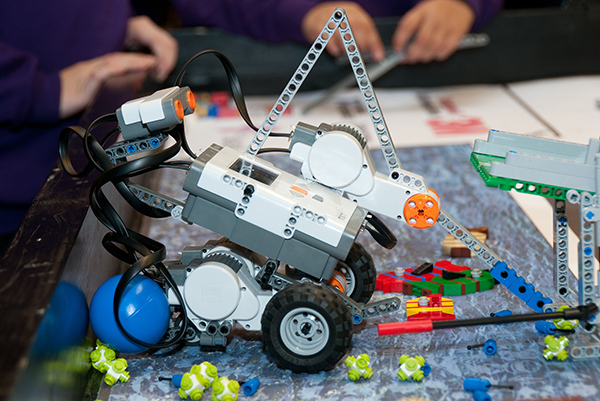 The FIRST LEGO League (FLL) sets scientific challenges to children aged 9-16. We hold regional events where teams compete as well as having a terrific day out. We are able to bring our activities to your school such as LEGO robotics workshops, Greenfoot Java workshops or informal panel sessions on any aspect of computer science. Contact us to find out more about our current offerings in this area. Key Stage 2 and 3: occasional workshops with LEGO® robotics. Key Stage 3, 4 and 5: workshops with Greenfoot — developing Java programs with animations. We have developed various resources for use with schools, including LEGO programming. We support the University's strategy for widening participation by working with the University's Partner Schools and Colleges and Enrolment Management Services. We contribute to the University's provision of Open Days, and to the Taster Days and Summer Schools run by the University outreach teams to cover all subject areas.